So I have a 19ft cresta craft, if i sold that i could get two jet skis and it seems fish just about anywhere? whats stability like on a jet ski when parked up fishing? i would suspect they roll everywhere? The larger "three" person ski's are very stable. I can stand on one corner and not tip it. (Only marginally under 100Kg). While I normally fish by myself I have had no problem with another marginally under 100Kg person on the ski as well! I also have a tow mat which I dont use now but when I did, provided more stabilty. This may be an option for you as well. Best way to find out is come out with myself or another jetski fisher sometime. keep the boat!.. unless you dont have/like fishing with friends... In my view thats half the reason you go fishing... hang with mates talk s h i t etc. Not as much fun catching a good fish and shaking your own hand or yahooing by urself. my 2 cents worth. If you have enough mates take out 3 of use at a time... $33 bux each! sorted as auw! Agreed boys. Boats all the way, take the family and mates out!!!! I have been around boats my whole life with having at least 15 various rigs whilst growing up and once I could buy my own I have personally had 3 boats and now have had 4 Jetskis. Boats are plenty of fun and have their place dependant on your circumstance and lifestyle. I will own a boat again one day, but I will also have a ski at the same time. Reality time though. My preference for using a ski is that I generally have time constraints with wanting to spend as much of my weekends with my young kids/family so something that I can have ready in 2 mins be on the water in 10, get out fast, catch as much as I need and back home again on a Sat/Sun morn with the ski washed down just as the kids are getting out of bed, is ideal for me. I am not one of those guys who takes the whole day to go fishing ignoring my family (thats just me). So quick fast trips are important for me to maximise my time, whether it be early mornings before work or in the weekend. The other reality is many people with boats generally speaking don't use them that often, especialy if you get into 7m plus categories, even more so due to time, other mates being available at the same time, and the share cost involved with running and up keep. 2.5 years ago when I first got into JSF there were approx 6 skis around NZ doing it. Now there are over 500 skis being used for fishing and when needed plenty of family fun. Many of the skis are now owned by previous boat/launch owners that LOVE it and wish they had done it years ago. For me I have always fished with various mates from my boats, but I will say this now, I have fished with more guys and made more great mates than ever before since being on a ski compared to fishing of a boat. Anyway I could go on and on with this topic for hours so I must stop here. Boats are great, but so are Jetskis it all depends on your circumstance and lifestyle requirements, so don't knock it till ya tried it. One last thing if you do.........there will be no turning back as it is the most addictive, habit forming thing you will ever do that is legal!! "DRY YOUR EYES PRINCESS THE PAIN YOU FEEL IS ONLY WEAKNESS LEAVING YOUR BODY"
well said 2X the other thing is try and find 3-4 mates when u wana go out! also there always ya mate while the boats in the water once it comes out where did they go? 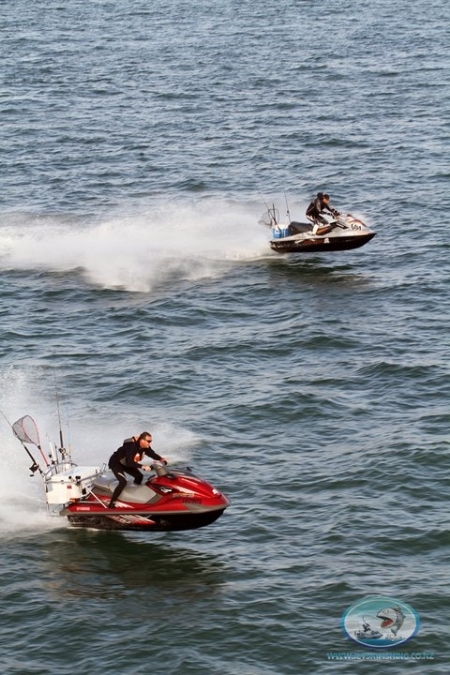 Here we go again, as 2-extreme says and I happen to agree, I have a 16.6ft Figlass, A 24Ft Atomix plus my Yamaha jet ski, i love to go out with mates and family but sometimes one just wants to get away on ones own, get in amongst the wash have generally chill. So for me there is good reason to have both. family also use the ski to nail a few waves and tow the little ones around as well. same thing as above, its differant strokes for differant folks so to speak. enjoy life while you can I say. Both. The boat for it's advantages, and a ski for it's advantages. Can see strong arguments for both and which you decided to use would be totally dependent on ya lifestyle/circumstances plus needs for the actual day. Would be nice to have both, say a small hardtop plus a jetski. All the options covered then! Like death2below, I have 3.9m IRB which is a bit of an inbetween the 2 really. Piss easy to get ready and launch by yaself but even more fun with a mate or 2 involved. Can do short quick missions easy as - I'm usually home by 10am most weekend mornings with good feed and a smile on the dial and less than $20 gas used.... On the other hand I can also do a full day mission further afield if I prepare well enough. Just can be a bit of a wet ride at times thats all. Plenty of room for heaps of gear too for those LBG missions and an easy way to come home with a couple of good sized kings rather than walking them out. Chose an IRB over a yak a few years back after a lot of contemplating and glad I made the decision I did. Now I'm thinking of getting something like a small stabi and moving up to the world of front steering but still keen to be able to get out by myself if I want. Yammie and Espresso are on to it. Have one of everything and then you have options! Have a yak and 6.2m fizzer and the Ski is next on the list. There's days when a paddle will be my preffered option, days when the boat is best and days when I know a ski would be ideal - for the same reasons as 2-Extreme . Can't see a launch fitting into the plan until I have the time to use it and the nice people at lotto think it's my turn! Everyone has different needs, circumstances and there's no right answer - more a matter of what are the options at any stage of your life. One thing to watch if you choose a ski is your undies will get all knotted and ride up your date and make you anti and grouchy when a boaty on this forum says a boat is a better option. Not sure why but seems to have been an issue for some time judging by past posts.